Academia Tertia Anglicana or The Antiquarian Annals of Stanford in Lincoln, Rutland, and Northampton Shires - Peck, F.
Title : Academia Tertia Anglicana or The Antiquarian Annals of Stanford in Lincoln, Rutland, and Northampton Shires. Map maker : Peck, F.. Size : 10.6 x 15.7 inches. / 27.0 x 40.0 cm. 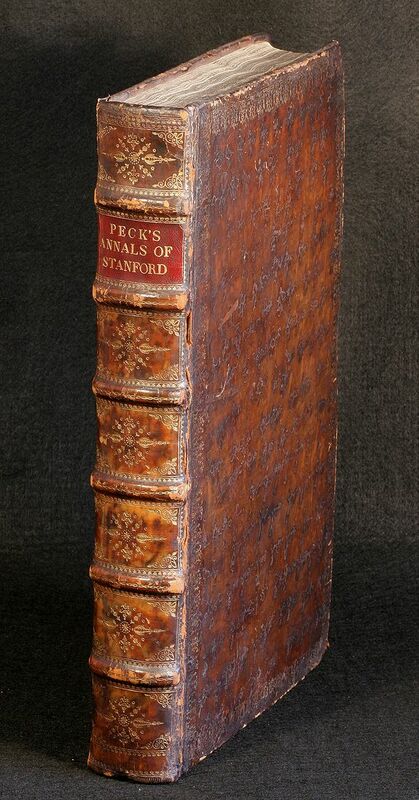 Description :First Edition of Peck's history of Stanford. Describing University, churches, schools of Stanford and several other places. Folding panorama frontis 'The Prospect of the Town of Stanford', dated 1719, sized 60 x 20 cm. Total of 33 engraved plates, 7 in text. In 14 books. Ex-libris Guy T.S. Sebright. Complete.